Chris grew up in Wisconsin and moved to San Diego in 1998 with about $400 in his wallet and without a car. He started his business on an idea that he could sell two extra tickets to pay for his own, and over 10 years later it has grown into a wild success. His passion and interest in music and sports led him to attend over 300 events. His ticket reselling business buys large blocks of inventory for professional sports events and resells them on the internet through three aggregator websites. Please describe your business and how it started. I wanted to see the Green Bay Packers play and tickets were sold out. I really wanted to go to the game so ended up figuring out some technical wizardry that enabled me to buy tickets for face value. I ended up buying additional seats and thought I could sell them and ended up making some money. Next year I kept buying more tickets and selling them while I kept my day job as an analyst. Two years later, in 2005 I quit my job to focus on growing my business, which has been profitable since day one. Why did you decide to apply for the MS in Entrepreneurship and Innovation at Kelley? How do you balance work and life as a Kelley Direct student? It’s been a culture shock. I organize my time in the morning by analyzing the assignments and reading and plan my day around it. For me, the remote function that Kelley Direct offers and being able to watch a class either live or after the fact is one of the best aspects of learning. I have been able to work on my assignments from all over the world; it has not been easy but certainly doable. Please describe your experience at Kelley School. In the beginning, it was a challenge while I was trying to figure out how to succeed at Kelley as well as contemplating my new venture and how it fits within the degree requirements. Now I see the momentum and the light at the end of the tunnel. I’ve also felt very supported by the staff and school since the beginning and I really do feel like the professors care about my success as a student. I’ve had a couple of “aha” moments where I felt like my classes have paid for themselves by strategies I learned and now employ in my business. The first one is learning a systematic way to approach the venture creation process from Matt Rubin and knowing that I can use the template for any future business idea. The second is the network as I didn’t have that when I started my business and it is widespread. How was your experience at Kelley Connect Week? It was great, I wish we had more opportunities for connecting in person. It is an overwhelming experience due to the class workload and by the end of the week, my brain was caput. I enjoyed getting to know my cohort. What advice would you give to someone about to experience entrepreneurship? Don’t be afraid to try and fail at a business, but start small first. Work on it and nurture the business until you determine if it is viable or not. Don’t risk anything you’d regret losing. Trust yourself but also remember you do not know everything: ask others for help and get a mentor! Be a voracious reader and ask lots of questions. Know yourself and what your strengths and limitations are, and surround yourself with people who complement your limitations. Being an entrepreneur is not all about fancy cars or life being easy. You have to sacrifice because you are working towards your goal and the potential rewards are what makes it worth it. ”Follow your passion” you have to be very disciplined, have focus, stubborn, tenacious and be willing to give something up in order to receive a bigger reward. Chris Hanahan graduated with a BA in Organizational Leadership from Chapman University. 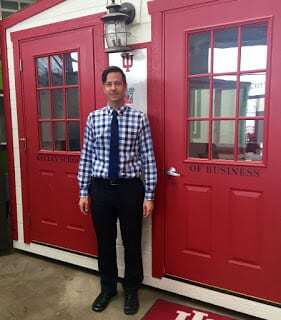 He is currently enrolled at Indiana University’s Master of Science Degree program in Entrepreneurship and Innovation, with an expected graduation date in late 2016. An active member of the Entrepreneur’s Organization, he has held many volunteer positions including the Global Chair for the Accelerator program. Founder at A List Tickets, a thriving enterprise that specializes in re-selling sports tickets online.